Michael "Eddie" Edwards was an unlikely but courageous British ski-jumper. He had determination, but not much else going for him, except for a very supportive Mum (who is a knitter) who helped him to never stop "believing in himself -- even as an entire nation was counting him out." Mrs. Edwatrds' hand knit sweater reads, "I'M EDDIE'S MUM"
"Eddie the Eagle" is a feel-good-cheer-for-the-underdog movie (release date 2/26/16) inspired by true events. 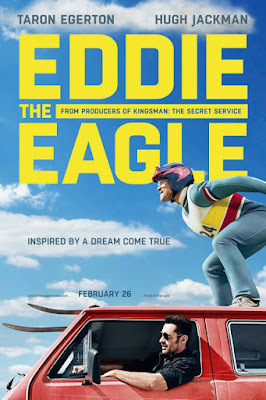 "With the help of a rebellious and charismatic coach [played by Hugh Jackman], Eddie [played by Taron Edgerton] takes on the establishment and wins the hearts of sports fans around the world by making an improbable and historic showing at the 1988 Calgary Winter Olympics." 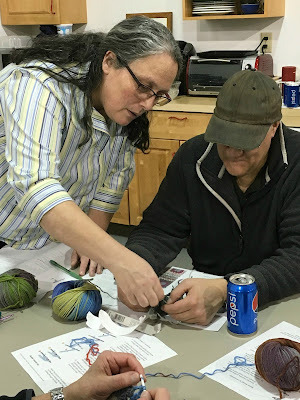 Join in on the fun and make a hat in support of Eddie! 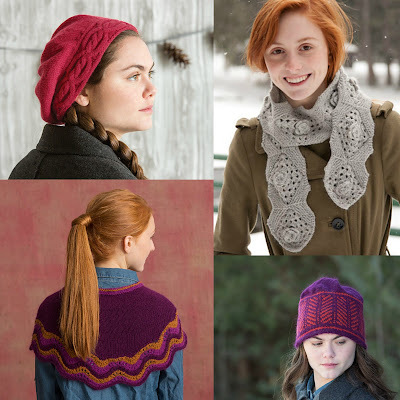 Grab your needles, and knit or crochet an "E" hat; you can find free patterns here (scroll down to the PDF links). Be sure to post a photo of your hat using the hashtags #iKnitForEddie or #iCrochetForEddie. 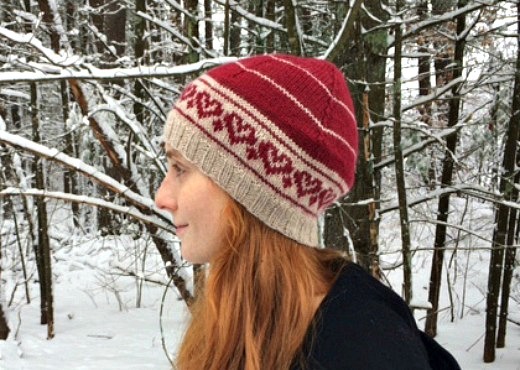 Susan knit this Eddie the Eagle hat using one marled and one solid colorway of Crestone. You could incorporate any letter you want by using the charts found here. 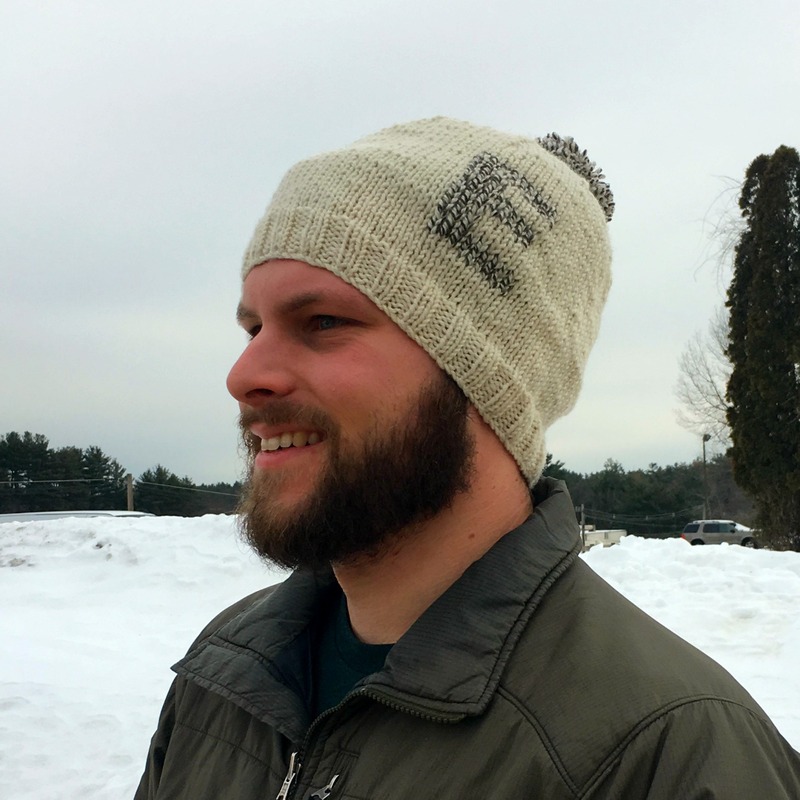 Dan is wearing an 'Eddie the Eagle' hat knit up in Crestone. Our 'E' stands for Eddie, but it could also stand for 'Everyone'. Eddie's dream was to be in the Olympics. What's your dream? Are you tired of your winter wardrobe? 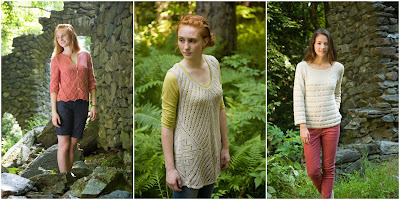 Need something quick to make and cozy wear to carry you through the last cold days of winter? 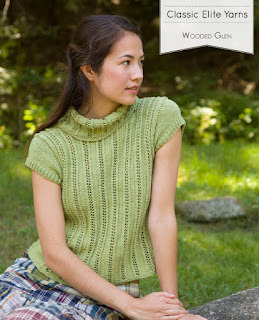 This would be a great time to give our Big Liberty Wool a try. See how the thicker yarn gives extra pop to the fun oversized floral motif of the Big Liberty Wool Yoke Pullover. 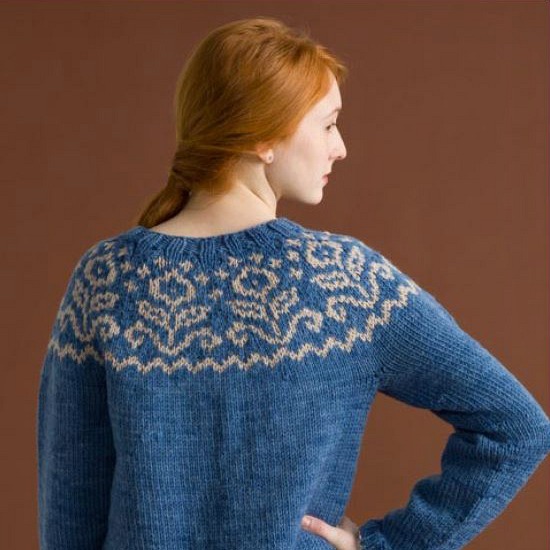 There's also our Blackthorn yarn from The Mountaintop Collection. 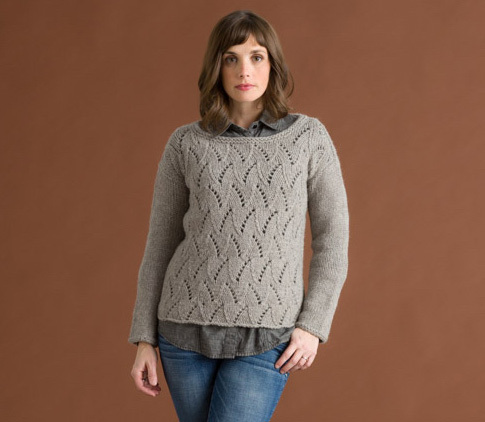 This week's new free Web-Letter pattern, the Chevron Flame Pullover, is ever so versatile and the natural shades of Blackthorn will mix and match with everything in your closet. If you want the drama of really big stitches, an accessory in super bulky Funky Chunky might be just the thing. Both The Tribeca and The New Yorker are newly released and work up in just hours. 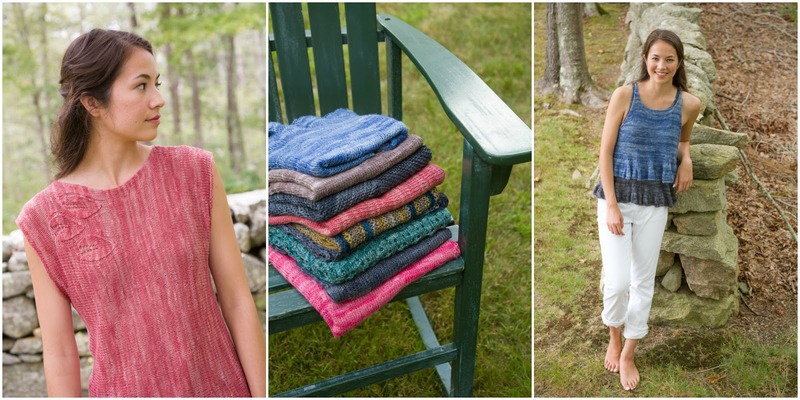 While the snow continues to fly and the mornings are downright chilly, how about whipping up a quick knit or two to lift your spirits? It's going to feel so good to have something brand new and cozily hand knit to wear until the longer, warmer days are here. 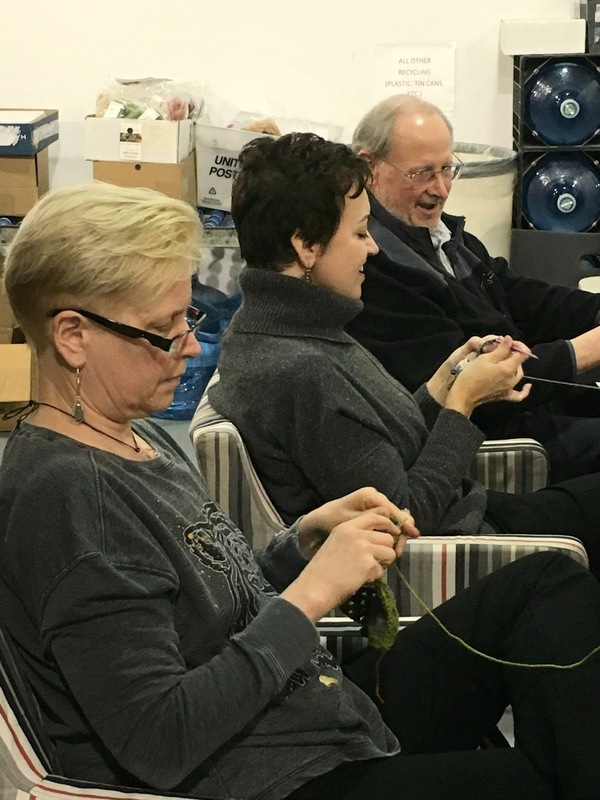 We all gathered in the office last week to learn to crochet. The entire staff participated – there were a few novices, a few beginners, and a couple of experienced crocheters (tasked with helping the newbies make a granny square). The goal? To make a Big Bad Granny throw. Linda, Tonia and Jim crochet in the breakroom. Edith was our leader. She had us crochet with two new colors of LibertyWool Print (Aquarius and Rendez-vous), along with two solid colors (Slate and Ash Gray). There was a lot of hand-holding, deep concentration, changing of hook sizes based on gauge (for some tight crocheters), and a lot of laughs! Edith gives Jeff a hand. We have 10 squares completed, and the last two are almost done. Then we’ll play with the arrangement until we get it just right and sew it all together. How to arrange the squares? As a group, we decided that the new throw should go to an LYS for all of its customers to ooh and aww over. Would you like your LYS to have this throw? If you'd like your LYS to receive the CEY staff version of Big Bad Granny, leave a comment by 8:00pm eastern time on Sunday February 14th. We’ll pick a random winner and announce the lucky LYS on Monday, Feb. 15th. Tell us why your LYS is so special! An LYS can toot its own horn too - let us know how you plan to create your own CAL fun. 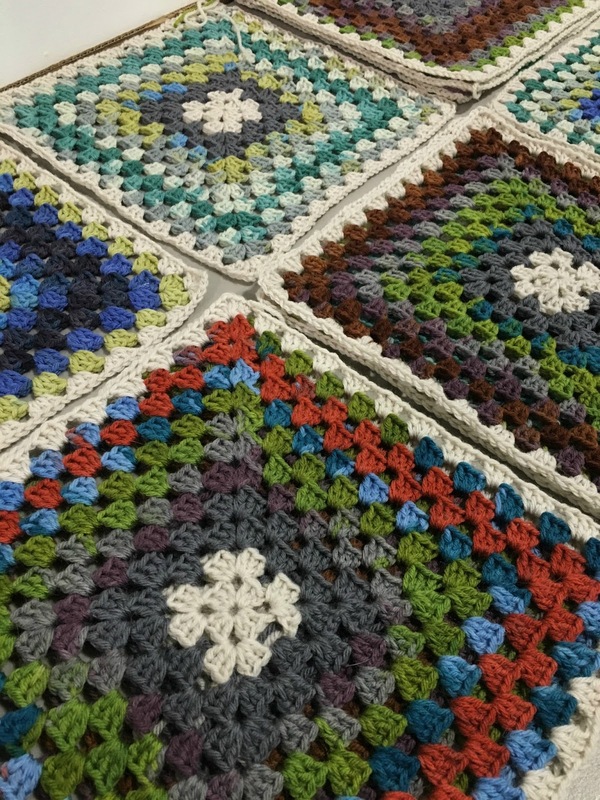 Now it’s time to go make more granny squares. We’re all addicted. 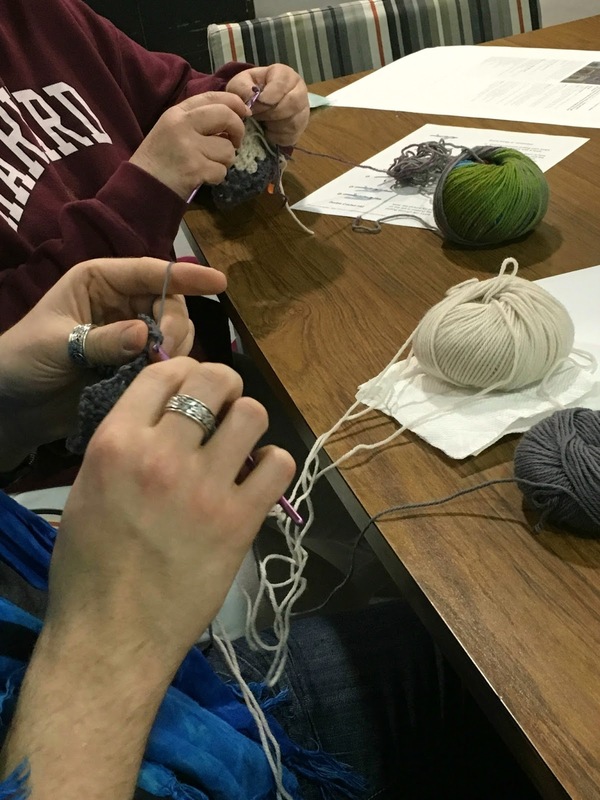 No matter who we choose to knit for, we knit for them out of genuine love and caring. Fresco is warm without being weighty and has a cozy halo. Isn't good love a bit like that? And what better week to knit with a special someone in mind? So, with Valentine's Day just a week away, we wanted to give you something special to knit up. This hat is knit in the round from the bottom up in two contrasting colors of Fresco. Set of 4 dpn and circular knitting needle (16") in size US 5 (3.75 mm) or size to obtain gauge. Circular knitting needle (16") in one size smaller. 23 sts and and 35 rows = 4" in St st, blocked. Take time to save time, check your gauge. m1: (make 1) Insert LH needle under horizontal strand between st just worked and next st, from the front to the back, knit through the back loop (1 st increased). s2kp: Slip 2 sts together knitwise from the LH needle to the RH needle, k1, pass 2 slipped sts over knit st (2 sts decreased). Knit on all sts every rnd. All rnds: *K2, p2; rep from *. NOTE: When working stripes carry unused color up beginning of round on inside. With smaller needle and A, CO 100 sts. Pm for BOR and join to work in the rnd, being careful not to twist sts. Work 2 x 2 Rib for 1". Inc rnd: *(K3, m1) twice, k4, m1; rep from * - 130 sts. Change to larger needle and knit 1 rnd. Join B and work Heart Pattern (rnds 1-13). Work 2 rnds even with A.
Knit 1 more rnd with B and place markers as follows: K13, pm, (k26, pm) 4 times, k13. Crown dec rnd: With B, [Knit until 2 sts before marker, s2kp] 5 times, k to end – 10 sts dec’d. Note: Read the next section carefully before continuing – stripes and crown decreases are worked at the same time. Change to dpn when necessary. Work even 3 rnds with B, then 1 rnd with A, (work 12 rnds B, 1 rnd A) twice. Complete hat with B. Cut yarn and thread tail through all sts twice, pull tightly to close hole at top of hat. Weave in ends and lightly block. Now that you've fallen for Fresco, here are some other great accessory ideas. Clockwise from upper left: Marta, Snowflake, Nell, and Lucretia. It’s still winter here in New England, but we can start to think spring and look forward to getting out of heavy coats and warm boots. And have you noticed that the days are getting longer?! 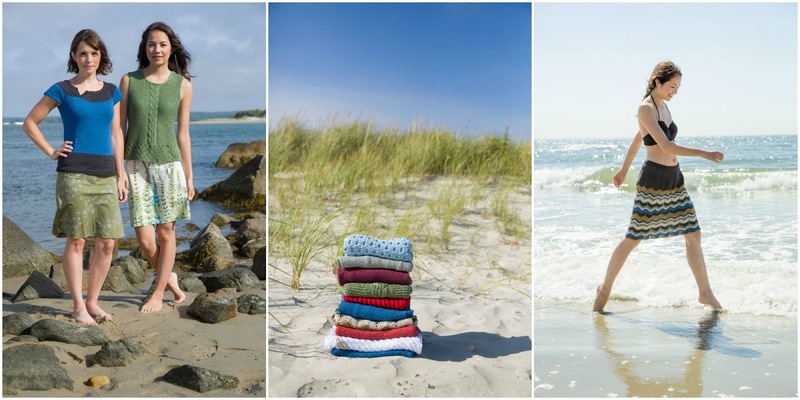 It's time to pick some favorites from our new spring collections, and cast on now so you'll be ready when the temperatures start to climb. In January we introduced WOODED GLEN, a collection of pieces made in our favorite trans-seasonal yarns. 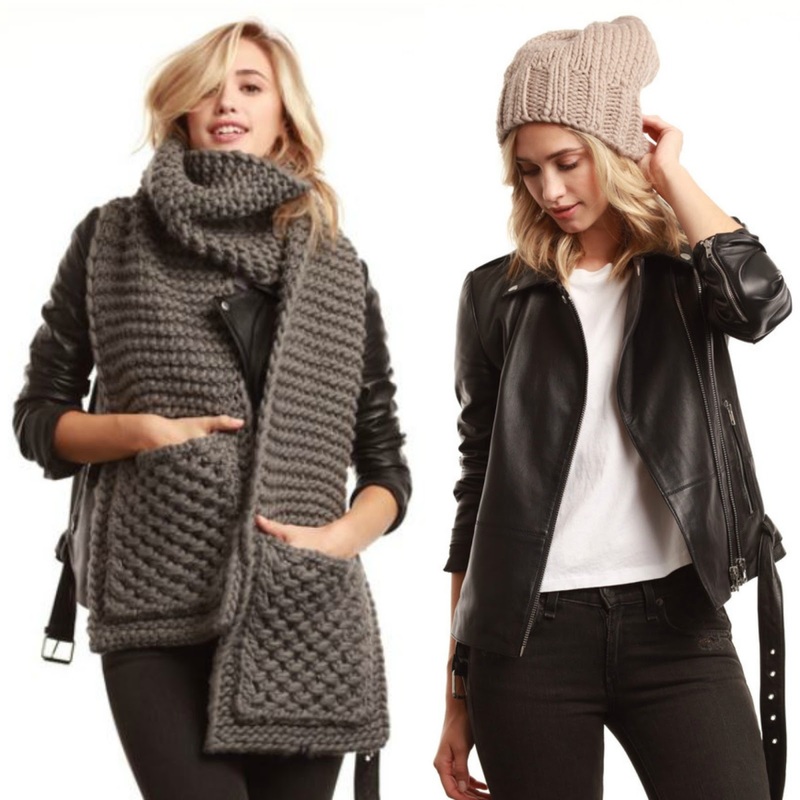 The pieces are great on their own or for layering - which you might need with spring's fickle temps. Looking for something new? How about CALISTA, just hitting stores now in early February. It's an elegant mercerized cotton in a chainette construction. 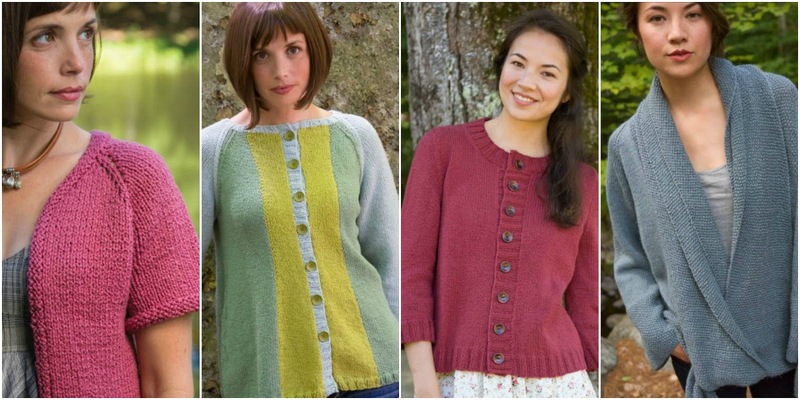 The exclusive "Calista" book has nine designs (7 knit, 2 crochet), including a favorite in our office, the Charlette 2-color top. FORTUNA will be arriving in March. It has the same gorgeous drape, fiber and weight as our best selling linen blend Bella Lino but with a fantastic tone on tone dye effect. Fortuna’s palette of clear colors have a washed out look perfect for summer. For April we have another collection in favorite summery yarns, HIGHLAND SUMMER. 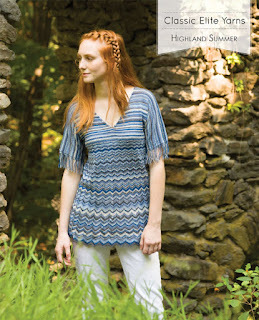 Designs span the seasons and include BONNIE, a stunning lightweight stripe and chevron top with fringed edge short sleeves. Our designers really outdid themselves this season, and we couldn't fit everything into our pattern books. 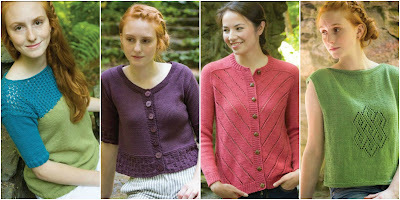 That means we will be introducing eight downloadable patterns from now through April as part of our weekly Web-letter.